When we last left our hero and heroine (also known as Drew and me), they were leaving Memphis, TN and headed down 78 Highway to Holly Springs, MS. If you’ve never heard of Holly Springs, you obviously haven’t heard one of the Dixie Diva Mysteries audiobooks that were written by Virginia Brown and narrated by me! These fun books revolve around Trinket Truevine, her cousin and best friend Bitty Hollandale, and several (ahem) “ladies of a certain age” who live in Holly Springs and can’t seem to stay away from chocolate, alcohol, and murders! I’ve narrated 5 of these books, and I understand that Virginia Brown is writing the next one in the series. I can’t wait to record it! As I was narrating book #5, Divas Do Tell, earlier this year, I commented to Drew that it would be fun to go on the Pilgrimage some time. 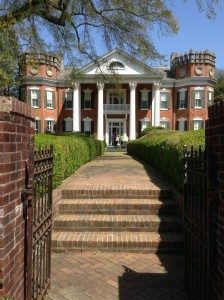 You see, Holly Springs has a number of antebellum homes, and each year the town Garden Club convenes a house tour known as the Pilgrimage. Many of the home owners or hostesses dress up in period costumes, and all discuss the history of the home and its furnishings. I looked on-line for the dates and was thrilled to see it was in mid-April. (I’ve since learned that it always is in mid-April.) We decided to go so I could get some pictures and videos for future marketing efforts. Since she’s been six years old, Bitty has wanted a particular house on West Chulahoma Avenue. The Walter Place is built of stone, has twin turrets like a castle, estate size grounds, and was a temporary home for General Grant and his family when they stayed in Holly Springs in 1862. Once I saw it, I could understand why Bitty would want it! Antiques fill the house, which again would fit Bitty’s style perfectly. The Terrace on Chulahoma is almost across the street from the Walter Place and also was on the tour. I liked how the owner of that house had mixed old and new furnishings in order to make it livable and comfortable. Some of the homes seemed more museum-like. They were full of fine antiques and knick-knacks without a TV or recliner in sight. 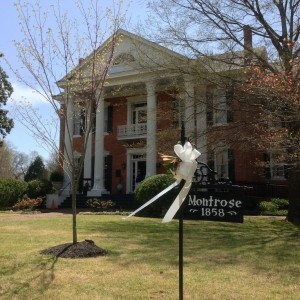 Montrose is a beautiful home that now houses the Holly Springs Garden Club and events like weddings or graduation parties. It also hosts the annual April pilgrimage. Like the Walter Place, Montrose has one of those beautiful curved staircases in the foyer. As we walked up to the second floor, I had to wonder how the women wearing hooped skirts — both on the Pilgrimage and the original owners in the 1800s — could actually navigate the increasingly small turns without taking a turn for the worse! We were very interested to learn how the house was kept cooler in the days before the invention of air conditioning. The slaves who built the house knew to use charcoal in the walls before adhering the bricks. The charcoal worked as a natural insulator. The front and back doors would be opened to allow the breezes to flow through the house. 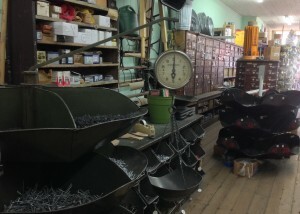 Booker’s Hardware has been in the same place since the mid-eighteen hundreds. It still has the same wide plank floors, old wooden cabinets that hold screws, and a lot of the same kind of merchandise. It’s a great place to buy a Number 8 washtub or a butter churner, or the newest in chainsaws or drills. Before leaving Holly Springs, we walked around the square and visited the cemetery. 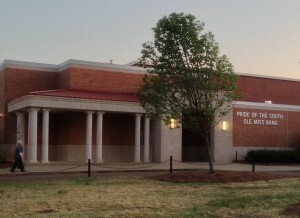 I was especially happy to hear Memphis radio station WKQK playing Barry Manilow’s Copacabana that Friday afternoon as we left Holly Springs and headed about 30 miles away to Oxford, MS.
Oxford is the home of the University of Mississippi, or Ole Miss as it is usually and affectionately known. In each book, we’re reminded that Bitty graduated from Ole Miss, and her twin boys are enrolled there. The campus features prominently in Divas and Dead Rebels (book 4) as the story line centers around a dead professor (gasp!). Since I went to a commuter college, I’ve adopted Ole Miss as my football team. If I had gone to school there, I probably also would have been in the marching band. While I only got to spend a short time in Holly Springs and Oxford, I look forward to Livin’ La DIVA Loca some more when I narrate the next audiobook in the series! I always enjoy reading your blog, and listening to your audio stories. Please consider taking the time to acknowledge the “slaves” you mention in your antebellum homes descriptions for what they really were; “Enslaved Africans”. No one on this earth can be born a slave as we are all born equal under the eyes of God. We can however be ” enslaved” by others. Hi, Pete! Thanks for the thoughtful observation. While I appreciate your valid point, rephrasing my wording doesn’t change history. However, your requested modification would direct the reader’s attention away from the servants’ clever use of charcoal in the walls to their plight as enslaved people, which changes the meaning of the sentence. Thanks again for stopping my blog.